Obavještavamo Vas da su svi zaprimljeni sažeci poster prezentacija prihvaćeni za objavljivanje u knjižici sažetaka i predstavljanje na kongresu. Dimenzije postera trebaju biti 90 x 120 cm (max. 90 - 140 cm), u vertikalnoj orijentaciji. Podsjećamo sve one koji nisu uplatili kotizaciju za sudjelovanje na kongresu da uplate mogu izvršiti na račun HDN-a. 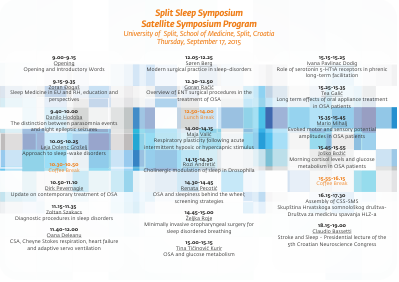 A satellite symposium on topic of sleep will be held as a part of the 5th Croatian Neuroscience Congress. Please find more information by clicking on the image to the right. Knjižicu s podacima o HIIM-u možete preuzeti ovdje. You can download the booklet with information about CIBR here. Više informacija o događanju "Noć kada mozgovi svijetle" pronađite ovdje. 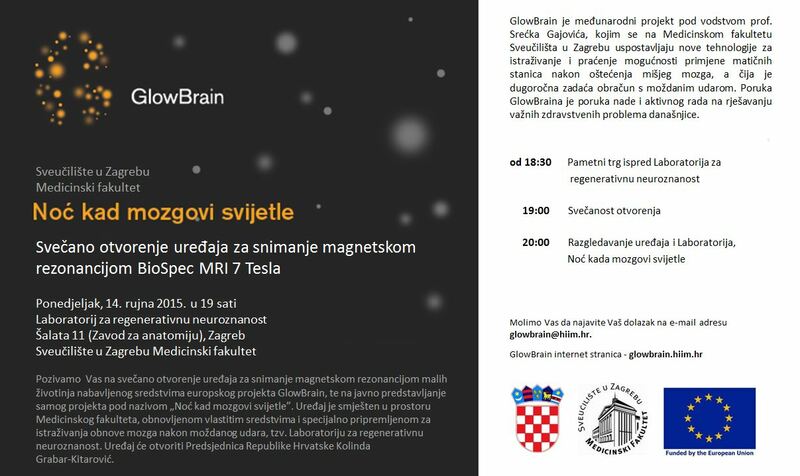 You can find more information about the Glowbrain event here. Zahvaljujemo tvrtki GE Healthcare kao sponzoru 25-te obljetnice HIIM-a.We would like to thank GE Healthcare for sponsorship of the 25th anniversary of the CIBR. Important: If you plan to attend the congress, please register on the link below. By doing this, you will avoid any potential problems with registration, materials such as ID cards and programs, participating in social activities etc. THE 11th INTERNATIONAL CONGRESS ON NON-MOTOR DYSFUNCTIONS IN PARKINSON'S DISEASE AND RELATED DISORDERS, NMDPD 2016, is a multidisciplinary educational forum that offers unparalleled access to the latest discoveries and developments in the etiology and therapy of non-motor features in Parkinson’s and other neurodegenerative diseases. NMDPD 2016 will be the center for deliberation on cognitive decline and psychiatric manifestations of brain diseases defined by movement disorders, as well as their other non-motor manifestations. In addition, this Parkinson’s congress provides major networking opportunities with leading neurologists, neuroscientists and related specialists from around the world. 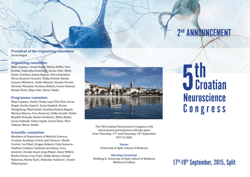 Join us in Ljubljana, the picturesque Capital of Slovenia, on October 6-9, 2016 for an exciting scientific program and the opportunity to contribute, connect with colleagues and build new collaborations.